Suitcases in hand, a cedar chest, and just enough money for a down payment on a 1955 Chevrolet, Milt and Jean Cole, two young kids, left their southern roots to begin their lives on a journey that has been filled with an enormous amount of hard work, lots of love, major success, and many, many blessings. 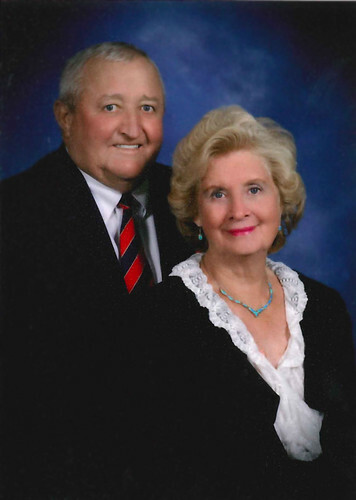 Their journey began in 1956 when newly married, they traveled north to Logansport, Indiana so Milt could work as a lumber inspector for John I. Shafer Company. Leaving all their family and major support in Tennessee to venture to a new community was difficult, but Logansport opened their hearts and arms and became a community they have absolutely adored their entire lives. At an early age, both felt they had a "purpose" for their lives. With stark differences in their personalities, Milt, being gifted with numbers and figures, has a strong work ethic, and positive attitude. Jean, filled with creative ideas, boundless energy, is always willing to say "yes" to no matter how hard the work was or what door it opened. Both began developing a common philosophy. Even at a very young age, they found by giving in some way, sharing with others, and caring, they were able to find the greatest joys, biggest rewards, and most successes. For Milt and Jean, giving is a way of life. Recalling some advice he took when he first arrived in Logansport, "I learned from my boss, John I. Shafer, and others a long time ago, that even with the best intentions in the world, you cannot give from an empty barrel," Milt replied. "I knew I had to achieve it, to give it." Jean on the other hand, credits her parents for making a huge impression on her when she was very young. " We were always cooking food, tending to the sick, or giving to families in need," Jean reflects fondly, "It was just second nature for them. "I often prayed as a youngster to be able to make someone happy the way my parents had always done for others." As they raised a family, some of their fondest memories were on Indian Creek Road. Managing the lumberyard and building a new home in the evenings and weekends, didn't leave a lot of time for recreation. Learning to balance both work and play were difficult lessons they learned, but necessary. Laughing, Jean confides, "I really do believe in hard work, it has made us the way we are today. But...I like to work hard, so that I can play hard." "For me," Jean continues, "you have to have balance, if you work all the time, you can't daydream about what you want to do in your life, and if you have time to play or daydream, then ideas will come." Crediting Milt's work ethic for getting ahead and putting every dollar away, they were always creatively thinking of ways to "stretch a dollar". "We were always on a tight budget," Jean remembered. "On Sundays, everyone would have leftovers, and all the neighborhood adults would gather around a bonfire and share their leftovers while the kids chased fireflies in the dark." Wanting to attend church and only knowing a handful of people when they first arrived, Milt's boss invited them to service at his church. Quickly they began meeting new people and started their journey toward getting involved in their community, as well as giving of their time and resources. Striving to give in ways they could, they thought "getting involved" was key. "You only win by doing these things." Milt replied. "The giver is the receiver, and we just wanted our community to be the best it could be." Traveling for the lumberyard took them to almost every state and continent in the world. This, however, opened their eyes to how special it was living in the state of Indiana. Especially, how wonderful their community became and is to them. "There is no better place I'd rather live than Indiana, primarily, north central Indiana," Milt concludes. Loving the land and always wanting to see it grow and prosper, they decided to branch out into farming in the late '60s and early '70s. Never being afraid of work during these years, Milt and Jean began to build their second home, as well as develop and run a Christmas tree farm. By the 1980's, Milt had been managing the lumberyard successfully for years. In 1986, they decided to buy the company. Following their own paths and philosophies, each dealt with their own set backs, fought fears, and even sustained failures. But through prayer, faith, determination, and a positive attitude, together they were able to overcome many of their obstacles and intertwine them toward a journey to success. "Don't be afraid to say yes when asked," Jean interjects. "By just saying yes when asked, whether it be to lend a hand, join a committee, plant some flowers, be on a board, or even help someone in financial need, it not only opens other doors for you to meet and know more people in the community, but it also helps you grow as a person." Having read words written by Charles Swindoll titled, "Attitude", Milt eagerly credits this for part of his philosophy. Charles Swindoll states, "....The remarkable thing is we have a choice every day regarding the attitude we will embrace for that day. We cannot change the inevitable. The only thing we can do is play on the one string we have and that is our attitude...I am convinced that life is 10% what happens to me and 90% how I react to it. And so it is with you...we are in charge of our Attitudes." "You can apply this to everything you do," Milt states. Like many, they were tested over the years. Some trials and challenges were small, and some big, but through it all they both believe as if they have been blessed. Knowing that God has a purpose for her and praying for just about everything that has happened in her life, Jean asserts, "sometimes God answered and sometimes he did not." She contends, "eventually you will find your gifts by doing things, saying yes, and working hard." At age 75, still having the desire to learn new things and take on more projects to help her community, she attests, "you will not find any true enjoyment of your life until you give back." Feeling God has blessed him as well, Milt concludes, "there is no greater reward than to help someone in need." Having more than a suitcase in hand, and a few dollars in their pockets 56 years later, Milt and Jean realize their blessing and are truly grateful for family and the power of love. Striving to live life passionately and successfully to date, Milt and Jean mutually agree that there is no greater feeling than to give.